In November 2017, three members of the so-called “Resistance” held a press conference to condemn the tax cut plan of President Donald Trump. 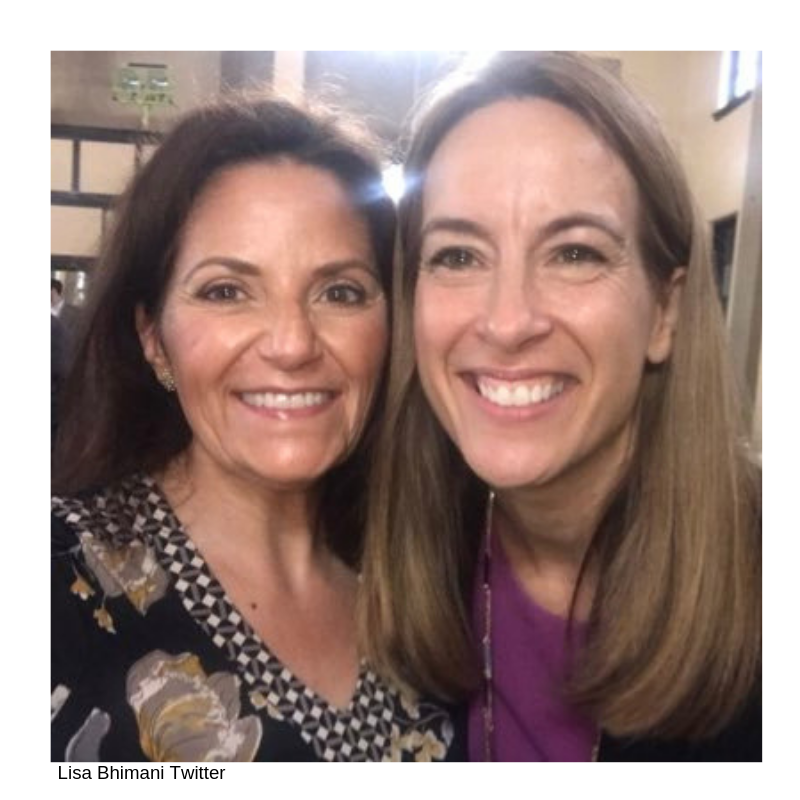 They were Mikie Sherrill, a resident of Montclair and then a candidate for Congress in District 11; Lisa Bhimani, a medical doctor and today a candidate for the Assembly in District 25; and Kellie Doucette, who has just been given a congressional staff job by Congresswoman-Elect Sherrill. At their press conference, the three “resisters” spoke on behalf of the state’s “middle class” and claimed that Trump and the Republicans were only out to help “big corporations and the ultra-wealthy”. They acted as though they were representative of the families who get by on the median-income of Northwest New Jersey. We now know, in the cases of Mikie Sherrill and Lisa Bhimani, it was all an act. Both Sherrill and Bhimani are rich. They are establishment members of the One Percent. But what about Kellie Doucette? She spoke as if she were a working mom, pinching every penny. Doucette has just been appointed to be Mikie Sherrill’s “face” in Sussex and Morris Counties. So who is she? 2017. December 21. US tax reforms approved this week by the US Congress will be “credit negative” for the Bermuda re/insurance market, Fitch Ratings says. The US credit rating agency added that it expected the tax reforms, which will take effect from January 1, to benefit US reinsurers at the expense of Bermudian and other international reinsurers serving the US. The Tax Cuts and Jobs Act will cut the US corporate tax rate to 21 per cent from 35 per cent, reducing Bermuda’s tax advantages over US rivals, and a new tax on premiums ceded by US insurers to foreign affiliated reinsurers will be levied. 2017. December 18. Bermuda-based reinsurers are weighing restructuring options in response to US tax reform legislation that could be signed by President Donald Trump as early as this week and come into effect by the start of next year. Tax expert Will McCallum said that the island’s major industry will see its cost of doing business going up when the reform takes effect and some companies will likely have to relocate hundreds of millions of dollars of capital to the US. According to public SEC filings, John Doucette was paid $2,557,414 in 2017. That’s $49,181.03 a week – that’s $10,000 more than a Deputy Sheriff makes a YEAR in Sussex County! Hey… is this “Resistance” movement beginning to feel more like a “counter-revolution” to you too? A long-suffering working class, under-represented in Congress and the Legislature, screwed-over by BOTH political parties votes for Obama in 2008 (and is promptly screwed again) then in its pain and desperation turns to Trump in 2016… and now the “Resistance” has come, to put us all back in our place! In his book, White-Collar Government: The Hidden Role of Class in Economic Policy Making, Duke University's Nick Carnes points out that while upwards of 65 percent of citizens are "working class" and 54 percent are employed in a blue-collar occupation, just 2 percent of the members of Congress and 3 percent of state legislators held blue-collar jobs at the time of their election. How about some diversity? Donald Trump's campaign saw through the false political divide of Democrat and Republican to the vast economic and social divide that is the truer measure of America today. Authors as diverse as George Packer of the New Yorker (The Unwinding: An Inner History of the New America) to Charles Murray (Coming Apart: The State of White America, 1960-2010) to Chris Hedges (Days of Destruction Days of Revolt) to David Brooks (BoBos in Paradise: The New Upper Class and How They Got There) have written about this, with Brooks actually employing Donald Trump as an example of what the "new upper class" finds unfashionable. And to counter this revolution, we have a One-Percenter “Resistance” made up of the likes of Mikie Sherrill, Lisa Bhimani, and Kellie Doucette. Congresswoman-Elect Mikie Sherrill wants Kellie Doucette to come into Sussex County and tell us how we should live. The Congresswoman has sent Doucette to “feel our pain.” But there’s a problem with this… and it’s Kellie Doucette. Just how insulated from the reality of the working-class is Doucette? Well, when she moved from Bermuda to New Jersey, she settled in Chatham, a town with pretty good schools… but apparently, not good enough, because she sends her kids to boarding school in Delaware. And not just any old boarding school… no way. When Hollywood is looking for a boarding school that just oozes establishment wealth and privilege, they turn to Saint Andrew’s School, situated on 2200 acres in Middletown, Delaware. You will remember seeing this well-appointed institution and its lush grounds from the Robin Williams film, Dead Poets Society, or from The West Wing, when they wanted to show what a really posh prep school looked like. Yep, this is one posh school that Kellie Doucette sends her kids to… fall tuition for 2018-19 will set you back a cool $60,470 (per student). Yep, tell that to the working families of Ogdensburg – with a per capita income of just $29,447 – next time you are in Sussex County. Hey, forget about feeling our pain, folks like you are our pain. But Kellie Doucette has a solution for people who once had good-paying blue-collar jobs but who now must make do with under-employment, working two or three part-time jobs to make ends meet… abortion. “Kellie Doucette began her career in the health policy field, and worked for over ten years as an actuary in the individual disability and long-term care reinsurance markets in the United States and Bermuda. However, in 2016, she shifted her focus to the political sphere, first as a founding member of Chatham Moms for Change, and then in 2017 as the campaign manager for a local political campaign. Kellie is currently the Constituency Director working with a congressional campaign in New Jersey’s 11th district, managing the constituency outreach for what has become one of the top watched congressional campaigns and races in the country this election cycle. These people are off-the-hook. Establishment moes and moettes who think they know better because they were well-born or have figured out a way to rig the system in their favor. Now they want to masquerade as “comrades” and lead a “revolution” that will secure their fortunes and attitudes and leave America and its working people in the dust. Mikie Sherrill got over on us this year, now Lisa Bhimani is trying for next year. Are we going to let them get away with it again? Is AFP even a conservative organization anymore?